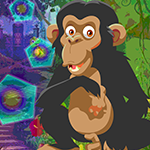 G4K Chimpanzees Escape is another point & click escape game developed by Games4King. In this game, a chimpanzee was living very happily in a beautiful and gorgeous village. But one day, that ape got unexpectedly stuck in a house. Your duty is to rescue the chimp. It will help you to find the hidden clues in the form of colours and numbers and to locate the items in the environment to save the animal. Find them all and solve all puzzles to free the chimpanzee. Good luck and have fun! Red flowers a little hard to place. Just had to keep trying them different places. don't have any red flowers yet, have 3 direction clues. have no idea where to use that. Ginner, in the first new scene where you place the turtles there are three grey buttons on the left wall where you use those directions. Kind of hard to see but they are there.